Whether you park your car in a spacious garage or you tend to leave it on the parking lot near your building, your car gets exposed to many threats. Weather conditions often cause the worst damage – rain and snow cause awful mold and mildew, the sun produces harmful UV rays, not to mention animal droppings, leaves, grime, and dirt that your car collects every day. Keeping your car coveredis the best thing you can do. It’s beneficial both for your car and you because it saves you a lot of time usually spent on a bothersome cleaning process, and it keeps your car safe from harm. However, you can’t use a regular fabrc found in your garage, can’t you? 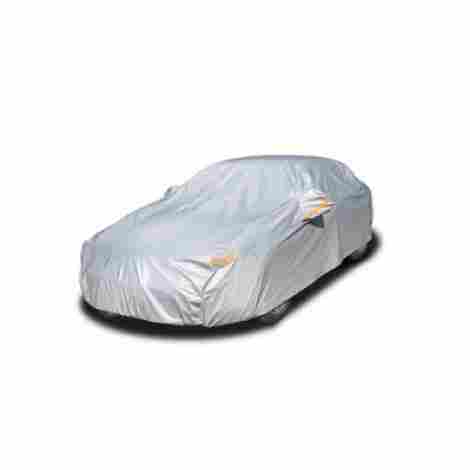 What you need is a specially designed product that will protect your car from the outside world! Our first pick comes from Classic Accessories, and it offers great value. PolyPro will keep your car safe from dirt, scratches, water, and sun damage while still being lightweight and user-friendly. That makes it perfect for daily use, especially if you need an indoor style. Overall, PolyPro is one of the most popular options on the market that’s also affordable, and you can choose a perfect one for your vehicle from 7 available sizes! This fits full-size sedans (from 191 inches to 210 inches long). As you already know, this type of product should protect your vehicle against rain and snow, or any water damage for that matter, but they can also produce mold and mildew. That’s why Classic Accessories offers an item that is both water-repellent and breathable. However, you should use this only for indoor storage or keep it away from harsh weather. It’s not sturdy enough to endure all possible weather attacks. You're probably aware of the fact that rigid materials can scratch the paint from the car, which is why Classic Accessories offers a product made of soft fabric. This kind of material is perfectly safe for your vehicle, and it should protect it from dirt, pollution, and sun. The item has an elastic bottom hem that allows a custom fit, along with tie-down grommets, and strings - these features keep it firmly attached to your vehicle, preventing it to come off even if it’s blowing a gale outside. PolyPro is reasonably priced, and it comes with a 2-year limited warranty. Just don’t forget that this is a lightweight option designed for indoor or limited outdoor use (can deal with mild weather). If you’re planning to use it indoors, you’ll definitely be satisfied with its value! Budge B-5 is a lightweight option that offers protection against dirt, dust, scratches, and mild weather. It’s designed for indoor use, mainly for cars parked in garages, but it can endure limited outdoor use. Actually, it’s hard to beat this Budge product in terms of value and budget price! 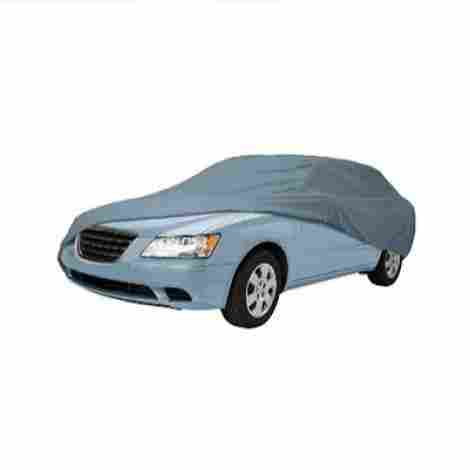 This is made of a durable single-layer polypropylene material which protects your car against dust, debris, liquids, and sun. This material is also non-abrasive, so it won’t make any scratches to your car. It’s double stitched which makes the entire product more durable. We shouldn’t forget to mention the ability of this to improve airflow and reduce condensation. That way, your vehicle is safe from mold and mildew. The Budge fits cars that measure 264 x 70 x 53 inches, but the manufacturer offers 5 different sizes from which you can choose a proper one for your car. It fits several types of vehicles. When it comes to securing it on your car, an elastic hem keeps the Budge on its place, along with sewn-in grommets. The package contains a storage bag and an antenna patch. Lastly, Budge is lightweight and easy to use which makes it perfect for indoor use. You can use it on the outside as well, but you should be careful with harsh weather conditions. This is not made to endure all possible weather impacts. Budge offers a great product at a budget price! If you’re searching for something lightweight yet durable, Budge is an excellent choice! It’s not suitable for outdoor use, but it provides a high level of protection and you’ll be amazed by its durability. Additionally, you’ll get a 2-year warranty for complete peace of mind. If you’re searching for an option that you can use both indoor and outdoor, you have just found the perfect one! Leader Accessories offers a versatile product that is perfectly safe for your car yet durable enough to withstand extended use. It’s one of the thickest items that can endure a lot, no matter if it’s protecting your car from scratches or from wind and snow. This is completely dustproof and it protects vehicles against dirt, dust, pollution, and harmful UV rays. It also has straps and buckles at the bottom to ensure proper fit and prevent any possible scratches. 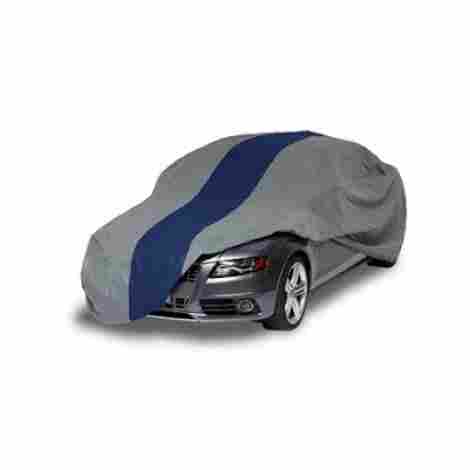 The material is breathable and biodegradable, it repels moisture and keeps your car completely dry. We expect nothing less from a 5-layer product made of the highest quality fabric. It’s just one of the products that’s meant to last! The only downside we found about this product is the fact that the inner and outer layer have the same design. That makes it difficult to figure out which side you should turn to the outside. This measures 199 x 61 x 50.5 inches but this is not the only available size. You can choose a product from 10 different sizes that fit Ford, Audi, BMW, Cadilac, Chevrolet, Dodge, and many others. It includes 2 adhesive patches with holes in the middle to accommodate antennas. There’s also a storage bag where you can put away the item when not in use. Leader Accessories is one of the cheapest heavy-duty options that you can find on the market. It offers great protection against extreme weather and other harmful situations, and it comes with an attractive price. You’re going to love it! Here we have another heavy-duty option that can protect your vehicle from various threats. The Audew is made of durable and safe materials which make it perfect for both indoor and outdoor use. If you want to have this versatile item in your garage equipment, keep reading to find out more about it in our detailed review! 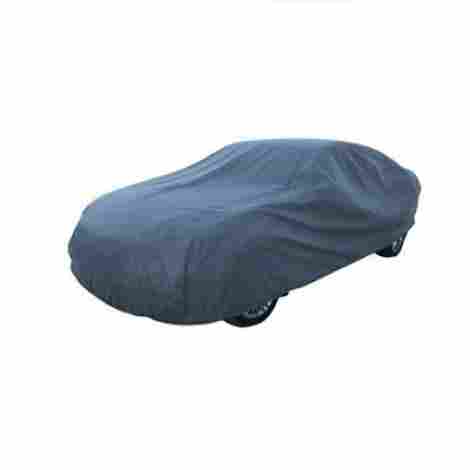 This is made of quality and high-density 190T polyester fabric that provides enough protection against many dangerous situations, while it also keeps your car safe from scratches. The material is soft and flexible enough not to be harsh on the car’s paint. It’s waterproof and it repels harmful UV rays, dirt, dust, and bird droppings. Additionally, it effectively blocks the ultraviolet radiation from the sun, which proves to be very harmful not only for the dashboard but for the entire car. The setup process is quite easy, there are straps and buckles at the bottom that you have to tighten once you’ve placed it on your car, and that’s about it. This should keep the product firmly on its place, even when a gale is blowing. You’ll also be pleased to hear that it is easy to clean and it has an anti-aging design. It also comes with a bag for simple transportation and easy storage. We were very surprised to find out that this heavy-duty item from Audrew is well-priced! Users noticed only one drawback – it’s not very durable when it’s exposed to direct sunlight or left under a big pile of snow for an extended period of time. However, keep in mind that this product comes with an attractive price and that even higher priced products are not capable of enduring the harsh weather conditions continuously. OxGord is one of the first-class products that keep cars protected 24/7. It’s suitable for indoor and outdoor use, made of high-quality material that offers a high level of protection against water, dust, dirt, and many other things and situations. If you’re interested in this quality product, follow our in-depth review and find out all about this great product! This product is made of waterproof 5-layer material – 3 layers are made of spending polypropylene, 1 layer is made of microporous film, and 1 layer contains soft fleece. It’s also very breathable and prevents mold and mildew. The material is soft enough to keep your paint intact when it is on. Lastly, OxGord offers 4 different sizes that should fit your car perfectly. That being said, some users still complained about it not fitting properly to their car. It seems that the Amazon "Make Sure it Fits" wizard is not doing the job well. You should follow the product’s description instead and order the size according to the measures of your car that you took on your own. This item has reinforced seams, front, and rear elastic hems, and drawstrings that should ensure a snug fit to your vehicle. There’s no wind that could blow it off of your vehicle (don’t test this during storms though). The package includes a storage bag and an antenna patch. You’ll be able to simply fold it down and put it in the bag designed for easy storage and transportation. As we already mentioned, OxGord offers high-quality items that can protect your car against various weather threats while being safe itself. It’s a bit pricey but it’s worth every penny! If you need an option that will protect your car indoor as well as outdoor, Kayme is a perfect choice! It offers many excellent features and high-quality materials, ensuring a high level of protection and a long lifespan. You can use this during summer and winter, no matter if you want to protect your car from UV rays or from snow and ice. It will perform excellently during any harsh weather condition! Kayme has 4 layers made of polyethylene, aluminum and cotton materials. Polyethylene is 100% waterproof while aluminum is great at repelling sun, and cotton is safe for your vehicle’s paint. Overall, these quality materials are completely safe for your vehicle and offer a high level of protection against harmful things and situations. Additionally, there are several available sizes from which you can choose a perfect one for yourself. This option is mainly designed to fit bigger vehicles like sedans, jeeps, and SUVs. It has a driver door zipper for easy access to the front seats. There are straps at the front and at the back that should keep it on its place, and a mirror pocket on both sides. We especially liked the reflective strip that lights up the entire car during night time. It’s designed to warn people about your car, to prevent them from bumping into it in the dark, and to help you find it more easily. The feature is not as useful in the practice as it’s meant to be, but it’s definitely cool! The only issue we found with this are flimsy straps. They will not fall apart easily but they could be sturdier. Kayme is a bit pricey but it’s definitely well worth the investment if you want what’s best for your car! Here we have a quality product that comes from XCar. It’s mostly designed for people who need an indoor style, but it can be used outdoors as well when the weather is not too harsh. Overall, we are talking about the great product that prevents scratches, repel water and dirt, and safely fit your vehicle. XCar offers a product that’s suitable for indoor use and limited outdoor use. Keep in mind that this can’t endure harsh weather so don’t expose it too much to the sun and snow. You should mainly use it indoors, and if that doesn’t work for you it might be better to search for another option. If this is what you’re looking for, you’ll be pleased to hear that you can choose from several available sizes, and the longest goes up to 228 inches. Lastly, it is made of soft materials so it won’t scratch your car’s paint, while it’s still rigid enough to provide excellent protection against many threats. This product has double-stitch seams and elastic hems to ensure a proper fit for any type of vehicle. There’s also a strap with a buckle on every corner that adds to the entire easy-to-assemble process. What we found very useful is an anti-theft cable lock that comes with and attaches to the bottom. You’ll also get a bag for simple storage and transportation, and an antenna patch. The XCar comes with an attractive price and it offers a 1-year warranty. As we already mentioned, the package includes a storage bag, an antenna patch, a cable lock, and a buckle. Therefore, you can easily get this as a present for your beloved ones! Titan Performance Products offer an excellent option that’s suitable for indoor and outdoor use. You’ll find this versatile item quite useful and well performing in various situations. The manufacturer made a real effort to provide quality protection in many sizes, so you can choose just the perfect one for your type of vehicle! 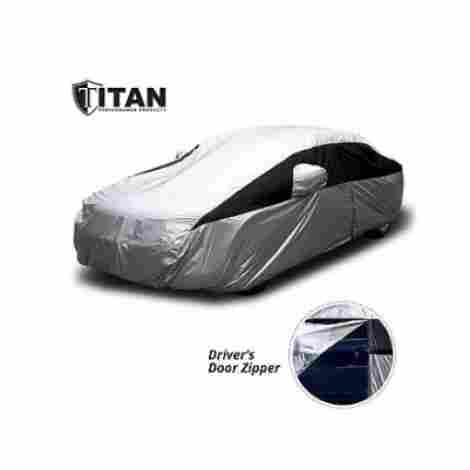 Titan fits Honda Accord, Nissan Altima, Ford Fusion, Chevy Malibu, and more types of vehicles. Just make sure you have taken the proper measures from your car because many users complained about this not fitting firmly to their vehicles. It protects the car against dirt, dust, scratches, and water. It’s also made of reflective sunscreen material that repels UV rays. However, keep in mind that this material is thin and lightweight so it might be hard for you to put it on the car on your own. Titan has a convenient driver door zipper that allows easy access to front seats when it is on. There are also sturdy straps and security loops on the bottom for a snug fit to your vehicle. Additionally, the material is scratch resistant and it won’t damage the paint if it accidentally comes off from your vehicle. The package includes a 6-foot cable and a lock for more stability and protection. Titan offers great value and it’s reasonably priced. It’s not as cheap as other previously reviewed options, but it’s neither too hard on your pocketbook. Most users think it’s worth every penny, especially considering its versatility. Yitamotor is an excellent choice for people who want a reliable option for outside use. It has high-quality materials and it offers many useful features that provide protection against various kinds of situations. If you want to find out more about this great product, just follow our detailed review! Yitamotor comes in several sizes, and the biggest is one that fits cars up to 209 inches long. You shouldn’t have any issues with its size, just be sure to measure your car accurately. The material is 100% breathable yet waterproof. It will protect your car against dust, rain, ice, UV rays, and many other situations, while still preventing mold and mildew. Overall, the material is light and strong, specially designed for high summer temperatures, but it can also effectively deal with rain and snow during winter time. This has a scratchproof inside lining – its thick soft fabric won’t scratch the paint on your car. Along with this useful feature, this comes with a lockstitch design in order to fit your vehicle perfectly. There’s also an adjustable strap with a buckle located in front and an elastic hem that keeps it securely on your car. What we liked very much is a reflective warning band for extra safety during the night. You’ll also get a bag for easier transportation and simple storage. We should address two possible issues with this product. Some users complained about straps not being sturdy. It seems that they get torn apart easily. The second issue is the lack of the antenna hole – while this is not an important thing for some users, others find it essential. This offers great value for money, but we have to mention one big drawback – its lifespan is quite short. It seems that you have to replace it after a year of usage. However, this is not so bad if you take into account the attractive price of this product. If you’re searching for something that will protect your car against scratches, mold, mildew, sun and rain, Duck Double Defender is an excellent choice. This has quality materials and several useful features that will make you love it! Duck Double Defender is made of triple-layer material that is non-abrasive and 100% breathable. 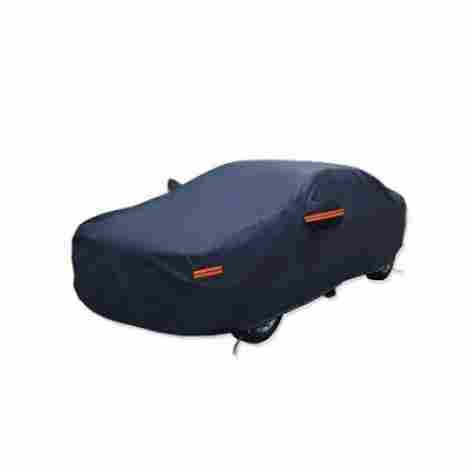 The soft fabric makes it safe for your vehicle, preventing any accidental scratches. There are also ultrasonically welded seams that improve the entire water resistance design, while UV treated material protects your car against heat and sun damage. We picked the one designed for sedans, but the same item comes in differently designed sizes in order to fit Hatchbacks, Station Wagons, SUVs, and Trucks. Even if this offers a high level of protection, we should warn you that it might not be the best choice for those who intend to leave the car on the outside during hot summer or harsh winter. Its outdoor use should be reduced to a minimum. Also, keep in mind that it is not designed to entirely encase the wheels. The product has elastic hem for a secure and proper fit as well as tie-down grommets and a rope. It comes in gray color but it has a navy blue rally racing stripe right across the middle. Not many options are as stylish as a Duck Double Defender. There’s also a bag that makes transportation and storage easy as it can be. Overall, this item is lightweight and well designed. Duck Double Defender comes with an attractive price and it offers a 3-year warranty. Regardless of the fact that this isn’t suitable for outdoor use, it does offer great value for the money! First thing first – safety! We assigned points to products according to the provided level of protection. Some are better for indoor use while others are better for outdoor use. Either way, it should perform as described in the product’s description. Of course, options that are suitable both for indoor and outdoor use are ranked higher on our list while the ones suitable only for indoor use are ranked lower. We also had to take into account the overall quality, including additional features, in order to rank the products according to their performance. Quality materials mean quality product, which is why we took into account the material of every option on our list. For example, products with more layers are safer for the vehicle and they offer better protection. It’s important to have one that is rigid enough to fit perfectly on your vehicle yet to be soft enough not to cause any scratches. Not to mention how important is to have a waterproof and sun resistant item. Therefore, every product received a certain number of points according to the quality of its materials. This should fit your vehicle perfectly, and there are several features that ensure this proper fit. For example, options with elastic hem, strong straps and buckles are known to provide extra stability even during the harsh weather conditions. Some manufacturers also include ropes and wires in the package, which we have found very useful. Products that offer first-class security features, providing a proper fit for various types of vehicles are ranked higher on our list. Lastly, we had to compare all products according to their overall quality and the value that they provide for money. Regardless of your budget, it’s completely rational to want a valuable product for the price. There are some outstanding options with surprisingly attractive prices as well as expensive ones that don’t stand out too much from the competition. Either way, you want to know that your chosen product will be worth every penny. That’s why the comparison of cost and value was so important in the evaluation of the 10 best on the market. We provided a list of 10 best on the market as well as the criteria used in their evaluation – that should be enough for you to be able to easily pick a perfect product for your needs. However, take a few extra minutes to consider some additional factors before you make the final decision and purchase. Take your car’s measures accurately! This is very important because it will determine the size. You don’t want to end up with a big one that flaps when the wind blows, but you neither want to have a too small option that can’t protect the wheels. Do you need a heavy-duty option that can protect your car from harsh weather conditions such as winds, snow, ice, sun, and rain? 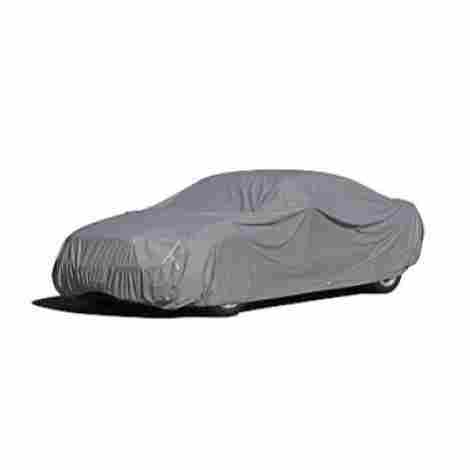 Or do you need one for indoor use, that will serve as a protective material when your car is in the garage? The answer will make the decision for you because not all are the same, and they deal with threats differently. Make no mistake to take the first one that is waterproof – there are options that can repel water but they can’t protect the car from the sun or ice. You want to be sure that yours is specially designed for the thing you need it for. When it comes to protecting a car from damage, we all want to have the best products for the cause. However, the most expensive products are not always the best products! There are many high-quality products that will provide excellent protection for your car while being easy on your pocketbook. Take into account your financial abilities and search for the best product in your budget range. Q: Are these bad for my car? A: These products are designed to provide protection against scratches and harsh weather conditions that could damage your car. However, sometimes they can cause some damage themselves. For example, if you don’t place it correctly the wind can take it off your vehicle, and rigid material can scratch the paint. What you can do while searching for the safest option is to pay attention to all features that it offers, and then decide for a proper one. Keep in mind that your car needs one that fits it perfectly. Q: Is every option suitable for indoor and outdoor use? A: Not every option can be used both indoor and outdoor. There are some that can endure a lot, and they offer a high level of protection against harsh weather conditions such as snow, ice, sun, UV rays, wind, and rain. However, many are designed only for indoor use. They can protect your car from scratches, light rain, animal droppings, dirt, and dust, but they can’t deal with harsh weather. That’s why you should carefully read the product’s description before you purchase one. Customers’ reviews can be very helpful too. 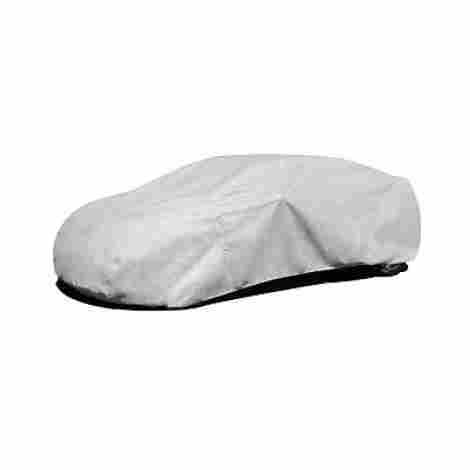 Q: Will this protect my car from snow? A: Of course it will! This is one of the best things that you can do to your vehicle during winter. You’ll be able to take off the pile of snow from your car as well as to keep it safely snug during low temperatures. Overall, they are one of the safest things for your vehicle whether you use them during winter or rainy autumn. They will keep your car protected against scratches, animal droppings, UV rays, rain, snow, ice, dirt, and dust on a daily basis. Q: How can I clean this? A: These days, most are machine-washable, and the cleaning process is quite simple. However, you’ll still need to take them to a Laundromat where they have commercial sized machines with no center agitator. If yous is not machine-washable, you can clean it directly while it’s placed on your car. Use mild soap or detergent to prevent any damages. If it has persistent stains, you can try using mineral spirits or denatured alcohol. The worst stains require stain remover or vinegar, just make sure not to rub but to dab the stains until they get off.